The following article in the British Medical Journal created controversy. Based on the report ‘Scientific Training and Radical Islam’ published by an Organisation called Centre for Islamic Pluralism it rings alarm bells over the so-called radicalisation of professionals of Muslim background working in the West. It specifically highlights doctors for the nature of the caring professions and the privileged standing they enjoy in traditional societies. It also places its concerns in the context of the attacks on Glasgow airport carried out by a small group of junior doctors in training at British hospitals which coincided with the preparation of the report. The BMJ article received passionate responses from medical professionals, some praising it and others criticizing its premise and its conclusions while a third group felt it did not go far enough in challenging the religious dogma. Whatever your views it makes for interesting reading. The disclosure that the leading alleged conspirators in last year’s bombing attempts in London and Glasgow were Muslim doctors sent a shockwave through the worldwide non-Muslim public. The same question was asked everywhere: how can those who are trained to heal turn to terrorism? Our organisation, the Centre for Islamic Pluralism, has compiled a report, Scientific Training and Radical Islam, which we were preparing when the London and Glasgow events occurred. The report is now complete and available as a free download at www.islamicpluralism.eu. It is a distillation of field research, interpretation of major source materials in Arabic, Farsi, Urdu, and English, and collation of individual perspectives from a team of Muslim researchers. All members of the team are experienced in the observation of Islamist movements throughout the world. The report offers answers to the questions asked by personnel in the NHS, which employed three of the suspects in the London and Glasgow incidents. Firstly, did the doctors who were alleged to have been involved in such a conspiracy represent a freak phenomenon, marginal and uncharacteristic of Muslim medical staff? And secondly, were they radicalised before or after coming to Britain? Our replies to both questions, based on our observations, are discomfiting. Many Muslim doctors, in Muslim and non-Muslim countries, have embraced the extremist doctrines of the Muslim Brotherhood, the Saudi Wahhabis, and the Pakistani jihadists. Such trends are also filtered through such groups as al-Muhajiroun, now banned in the United Kingdom but which recruited medical students, and Tabligh-i Jama’at, an Islamist movement that is particularly prominent in the UK. Also, radicalisation of elite professionals is more a product of conflict within Islam itself than of social conditions in Britain. But the problem is not one of religion: rather, it is ideological. Two explanations for the radicalisation of the Muslim doctors have gained currency. Firstly, that it is due to the same forces that are said to motivate other radical Islamists: deprivation and corruption in countries with a Muslim majority and the humiliation of the Palestinians and Iraqis at the hands of Israel and the European and US powers. Secondly, that it has been due to the overproduction and unemployment of doctors in countries like Egypt and Pakistan. That view was elaborated mainly by observers of the Muslim Brotherhood in Egypt, after the group’s success in penetrating and taking over professional associations, including those representing engineers, lawyers, and journalists, as well as doctors. Our report suggests that neither of these explanations is adequate. The politics of victimised peoples and the economics of professional underemployment cannot account for radicalisation of professionals in Saudi Arabia and Iran. The Saudi kingdom and Iran have remained independent of foreign rule, and neither has trouble employing its doctors; yet in both countries radical ideology is common among medical and other professionals. Most of the world’s Muslims, including doctors, are neither fundamentalists nor followers of radical sharia and do not become tainted with Islamist prejudices. But our report suggests that many Muslim doctors and other professionals are attracted to an ideology that projects a solution to all human problems in a fundamentalist interpretation of Islam, along with a demand for exclusive governance that is based on the radical Wahhabi and related forms of religious law or sharia. Medical and other professionals represent an elite in Muslim societies and have become an important component in the intra-Islamic "jihad" to impose an ultra-militant outlook on more than a billion Sunni Muslims across the globe. Such professionals have a moral and social standing that can influence others to stray from mainstream Islam, which sees itself as one faith among many. Furthermore, some Muslim doctors working in non-Muslim countries may bring from their native environments a propensity for radical ideology. In Muslim societies the physician is often seen as something very like a religious scholar—just as clerics are often consulted for physical ailments. Medical education, even if conducted in Western institutions, may not break down belief in this paradigm. Indeed, the ordinary Muslim may consider the successful Muslim doctor to be superior to the mainstream cleric, and the radical Islamist doctor may easily usurp religious authority from a traditional imam. This disturbing phenomenon is visibly growing. A member of our centre, Khaleel Mohammed, has noted that in the Muslim diaspora in the English speaking countries "Muslim leaders have not traditionally been chosen for their Islamic knowledge but for their stature in society—a medical doctor, a computer scientist." The role of Muslim doctors in taking extremist ideology to the Islamic masses has been well expressed by Mahmoud Abu Saud, an Islamist author active in several countries. He wrote, "The doctor has a big say and great weight in influencing his patients and in righteously guiding their orientation. Besides, he should be actively involved in propagating true Islam among Muslims and non-Muslims . . . the best missionary service to be rendered by a medical doctor is to behave at the time in accordance with his Islamic teachings." Abu Saud offered these comments in his contribution to one of the most revealing sources on this topic, a volume titled Islamic Medicine, edited by Shahid Athar and published in Pakistan in 1989. Dr Athar is an endocrinologist. 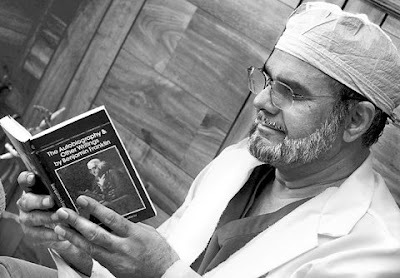 His work reflects an attitude also seen in the Islamic Code of Medical Ethics, published by the International Organization of Islamic Medicine in 1981, which states: "The Physician should be in possession of a threshold knowledge of jurisprudence, worship and essentials of Fiqh [Islamic religious law], enabling him to give counsel to patients seeking his guidance about health and body conditions, with a bearing on the rites of worship." In an aspect of the problem that is little known or understood by Westerners, the version of Islam presented by radicals as "modern" and in keeping with the social status of the medical professional is one that is stripped of tradition and spirituality. How, then, may medical professionals and the government in the UK, and the West in general, respond to this challenge? The Islamic Medical Association estimates that about 10 000 Muslim doctors and nurses practise in the UK. Vetting of Muslim doctors for radicalism may prove ineffective and will doubtless create a civil liberties problem. It is more important for the UK authorities to monitor closely the activities of radical Islamist groups and to act decisively against those that legitimise or incite violence. Most important of all is to strengthen the authentic and proven anti-extremist trends in the Muslim communities themselves. To that end, we call for the organisation of new professional associations of traditional and moderate Muslim medical personnel, engineers, and lawyers, to repudiate extremist ideology. The radical Islamist doctor may easily usurp religious authority from a traditional imam. Thanks for posting the article on your blog. We recently wrote on this issue at Brain Blogger. We drew on the parallels between the Catholic Church and radical Muslim ideology. Just as the Catholic Church was once known as much for their political actions as it was for religious doctrine, many Muslim doctors today are regarded both as medical adviser and religious leader. Sometimes, in fact, their professional clout gives them more religious stature than someone known only for their religious authority. We would like to hear your comments on our article. Thank you. You raise very relevant points in your article which echo some of the conclusions in the original report. I am not a muslim myself but your analysis of the role of medical practioners extending beyond their technical abilities to a more pastoral one does not strike me as unique to Islam but common to most societies to different extents including western industrial society until not that long. At the end of the day medical school is competitive, attracts motivated (hopefully talented) individuals generally from privileged backgrounds. All these attributes makes them potential leaders, and some of them do actually decide to use that potential outside their chosen field. On the issue of why they choose to support fundamentalist interpretations of Islam, that has been a trend that transcends classes, ethnicity and profession. Doctors cannot be expected to be immune to it by virtue of their profession. History shows us that they never have anyway.singling them out deviates us from the real problem at hand.